I don’t play video games much, but one year I was a member of a group at Intel where a bunch of the engineers played Quake III Arena every day after work. 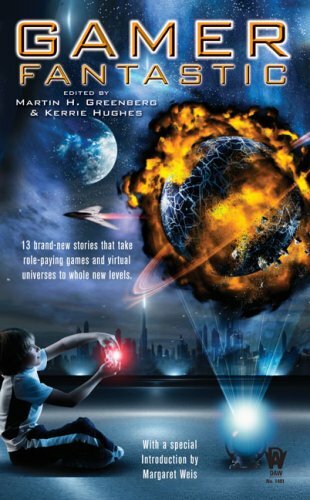 I enjoyed the game, even though I never got any good at it, so naturally when I wrote a story about gamers for this anthology I had to work off of that experience. (Though the game in the story is more like World of Warcraft, which I’ve never played.) Making the relationship between the real world and the simulated world clear to the reader was quite a challenge. Carlos Ramirez sweats under his goggles as his avatar runs down a corridor of Chaos Inc’s corporate headquarters. His legs aren’t really moving, but his heart is still pounding hard, because even though what he’s seeing now is only a simulation, his pursuer is real. Five meters behind Carlos’s avatar, a heavily armed and armored battle suit crashes along, its metal feet tearing holes in the carpet. “Hold still, you little fucker!” comes the wearer’s grating amplified voice, followed by another burst of machine-gun fire from the forearm gun. Distantly, the sound of gunfire comes to Carlos’s real ears. Getting closer.